More often than not it is impossible to satisfy all requirements, so I end up settling for the least evil option, even though prioritising the various criteria is hard work, too. Enter shopping for liquid hand soap. I prefer buying refill bottles instead of individual containers – it is more economical and minimises plastic waste. However, I’m also a bit of a scent maniac with a very particular nose, so my soap can’t just do the job – it has to smell nice. And whatever I think smells nice is obviously not what the general population finds nice. Every time a product I like disappears from the market, I have to go on a quest. And so, I’ve been on a liquid soap quest lately. It’s been hard, because here is my number one disqualifying factor: Is it antibacterial? I’ve discovered that most of the nice-smelling ones are. In fact, most soaps on the market are. Antibacterial soap is good old regular soap with a couple added ingredients – most notably triclosan, an antimicrobial and antifungal agent that started out as a hospital scrubbing compound. It has become such a ubiquitous addition to household items that anything ‘antibacterial’ is likely to contain it. It is also completely unnecessary. Studies have shown that antibacterial soap doesn’t work any better than normal soap, unless you wash your hands many, many times a day for several days in a row. Subsequently, its use does not really reduce the most common illnesses, such as colds, flus, and stomach bugs for example. Obviously, that’s because all these infections are caused by viruses. Duh. Apart from lack of effectiveness, antibacterial soap can actually cause harm – there is speculation that overuse of triclosan could be aiding the rise of ‘superbugs’ – antibiotic-resistant bacteria, one of the biggest health threats currently faced by humans. Additionally, exposure to triclosan has been associated with increased incidence of food and inhalant allergies.There are also animal studies that have shown other alarming effects, although these have not been proven in humans. If that’s not enough, triclosan is also a pollutant, and the amount that escapes sewage water treating systems ends up affecting aquatic bacteria, as well as algae and even fish. 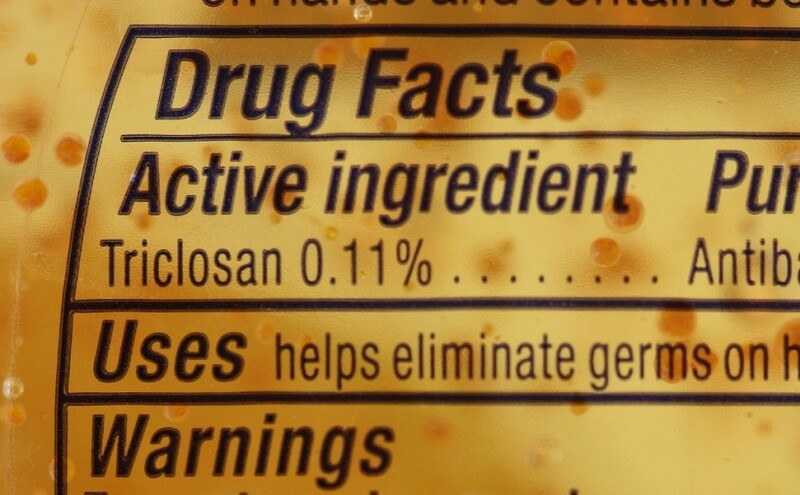 So if you are to avoid triclosan, how will you keep your hands clean? Why, with good old regular soap and water. Hopefully you can find some that smells nice. Last year the American Food and Drug Administration decided to crank down on antibacterial soap. You can read a bit more about this over at The Smithsonian.